5) Annually Rotate Your Crops: A widely adopted practice in both gardening and agriculture is to rotate crops from year to year. In a serious rotation plan, you won't grow the same crop in any plot for 4 or even up to 6 years. This offers several undeniable benefits and is a great practice (when possible). By alternating the types of crops growing on a plot, you can shift from plants that accumulate nutrients to ones that deplete. Nitrogen fixing crops can be used to build nitrogen levels and add plant residues. Plant specific diseases are less likely to build up over time. If you have a large, open plot you can divide it into sections and then alternate the position of your nightshades, brassicas, etc with each year. With four or more raised beds, you can do the same thing. But what if you don't have a homogeneous, open area devoted to gardening? THE CHALLENGE: In an urban setting, your garden may be near your house or other structures. Buildings, trees or fences may obstruct lighting. Odd shading patterns through the day might offer only 1 or 2 optimal full sun spots. -Perfect for plants like peppers and tomatoes! But there may be areas with partial shade that are relegated to cool season and shade tolerant crops like lettuce. You may put some serious work into garden infrastructure, building trellises and specialized raised beds. You have the perfect spot for a watermelon or corn or a tomato! So, how could you just juggle everything by swapping things around? It might not be feasible on a small lot. THE WORKAROUND: Maybe your peppers are going to grow in the same basic spot every year. Does that mean that your soil is destined to accumulate pathogens? Will it be slowly depleted of key nutrients with each passing year? Not necessarily! Here are some tips that can help, even if a proper multi-year rotation sequence is out of the picture. Seasonal Crop Rotations (Succession Planting): The same primary crops may occupy a bed or container from year to year. But are you able to plant an early Spring crop of a different family? 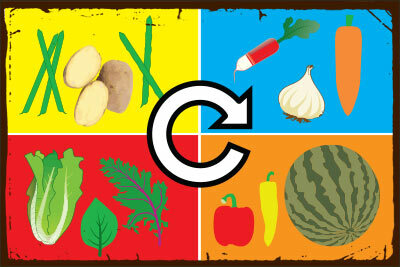 Or could you follow up your Summer crop with a Fall planting of some cool weather veggies? Fall crops could be selected for natural nitrogen fixation. Or they could be used as a way of scavenging excess nutrients that have built up in your soil. Leaving you a clean slate for the next year. Polyculture (Companion Planting, Interplanting, Intercropping): Rather than growing your crops from a monocultural approach, why not diversify? Some plants can grow successfully alongside unrelated varieties. A classic example is corn, squash and beans. Herbs such as basil might do very well at the base of some tomatoes or peppers. Interplanting several crops can balance out pest populations and improve your soil profile. Remove and Compost Plant Residue: Having organic matter in and above the soil is a good thing. But if you keep planting the same crops in the same basic space, plant residues could become an issue. Certain pathogens target specific plant families. They can persist in soils for months after the crop is harvested. Some garden pests may overwinter in the debris of dead plants, coming back the next season with greater numbers. For these reasons I pull out the residues of my dead plants (upper growth and root balls). I then hot compost or vermi-compost the plant waste to kill diseases and pest eggs. Then I can apply the compost or worm castings as a balanced nutrient source that is teaming with beneficial properties. And the soils are reset for another year, ready for fresh plantings. The bottom line: Annual crop rotation is great. Successional rotations could be an alternate strategy. Relying on annual polycultures is another option. No matter what you try though, you'll need to replenish the nutrients that you've depleted through the season. This is especially true in containers. Simple rotations will never be enough to recover from the rapid depletion that results from intensive gardening or farming.